“Today I am a man!” To hear these words coming from the mouth of a thirteen year old boy is nothing strange in Jewish life. On the day the boy comes up to the reading of the Torah for the first time at his bar mitzvah, he takes on the ancient responsibilities of his faith. Many think that since time immemorial, Jewish boys have been going through this ceremony, joined in recent years by girls celebrating bat mitzvah. But they are wrong, for bar mitzvah is not as ancient, and bat mitzvah is not as young, as people suppose. And this is the ruling: it is a duty to recite this blessing over one’s son when he is thirteen years and one day old, when he stands up to read from the Torah, and one needs to stand over one’s son to place one’s hands on his head, and to recite the blessing as expressed here. And this is the French custom. But who read the Torah commentaries of Avigdor the Frenchman? Rashi and his better known followers appeared to know nothing of bar mitzvah. So it might all have been forgotten about were it not for changes in the European world-view at the Reformation. In many Churches the “ritual of the word” took on an increasing importance—and at the same time Jewish parents in Germany and then in Poland took up the idea of bar mitzvah with enthusiasm, celebrating with their friends and with the boy making a speech to show his learning. Some found the new fangled custom a step too far, but it soon spread across income groups, from the pious to the less involved, and geographically as well. Rabbis were not asked for their approval—it just happened. “Let us not have too many of them” grumbled Rabbi Solomon Luria “or it will completely disrupt our time for Torah learning.” Little did he know how popular it would become. The new custom became established in Poland—in those days half the Jews in the world lived there. What happened there was going to spread out elsewhere as Jews travelled. From Krakow in 1595 we have the first community rules to regulate the ceremony, laying down the right of the bar mitzvah to be called to the Torah, the size of the party, and even the food that could be served. From Worms on the Rhine in 1617 we hear for the first time of a boy having to relearn his portion because it was discovered at the last minute he had been taught the wrong one. In Hamburg (1712) we have the first recorded instance of a community banning bar mitzvah parties because of the boys’ misbehaviour. In 1748 the celebration crossed the pond, when Mordecai Sheftall became bar mitzvah in Savannah Georgia. A couple of generations later, in 1817 in Berlin, the very first ceremony for girls was held. The congregation of 400 was “moved to tears” at this “most festive and most beautiful celebration.” Yet now, as we approach the two hundredth anniversary, that event has been forgotten. Judith Kaplan’s bat mitzvah in New York in 1922 is widely remembered. Why such selective memory? One reason is that the many ceremonies for girls in the nineteenth century were “confirmation” ceremonies. The girls did not read from the Torah, but graduated as a year group and answered questions about their faith. Was this thought more suitable for girls? Perhaps, but many boys have had exactly the same ceremony over the last 200 years. Bar mitzvah was in slow decline throughout the nineteenth century and Reform and Conservative synagogues replaced it with confirmation for both boys and girls. In Orthodox synagogues, Hebrew standards declined, and bar mitzvah boys were often just saying the Torah blessings, not reading from the scrolls. In the 1920s and 1930s the bar mitzvah revival began, spreading from the USA where formal educational requirements were introduced. With higher minimum standards, the sense of achievement was revived and more families wanted to celebrate. Since WW2 girls in many congregations have had individual ceremonies at which they too can read from the Torah on a Friday night or Saturday morning. Today, group confirmations are in decline and bar and bat mitzvah are more popular than they have ever been. Non Jews celebrate “faux mitzvah”, black Americans “black mitzvah” and dogs come along for a “bark mitzvah.” Parties are often extravagant but Jewish renewal with its DIY approach is strong too. No longer do we have, as was common two hundred years ago, the situation where poorer families are unable to celebrate, for we live in a world where everyone can do their own thing, from a few drinks at home to hiring a football stadium or a cruise liner. Older people too have joined in: over 500 communities across the USA offer courses leading to adult bat mitzvah: there have even been groups of women celebrating together in their care homes. Older men too are joining the party: at the age of 83 men come forward to celebrate a second bar mitzvah, and even a third at the age of 96. In an age where Jewish weddings and circumcision are both on the decline, bar and bat mitzvah are surpassed only by Jewish funerals as the most widespread Jewish life cycle event. By chance, the ceremony became one that appealed to everyone, the key to its success being the mixture of the social and the spiritual, the bar and the mitzvah. Want to get hold of the book? Click on the book cover! The Jewish coming-of-age ceremony of bar mitzvah was first recorded in thirteenth-century France, where it took the form of a simple statement by the father that he was no longer responsible for his thirteen-year-old son. Today, bar mitzvah for boys and bat mitzvah for girls are more popular than at any time in history and are sometimes accompanied by lavish celebrations. How did bar mitzvah develop over the centuries from an obscure legal ritual into a core component of Judaism? How did it capture the imagination of even non-Jewish youth? 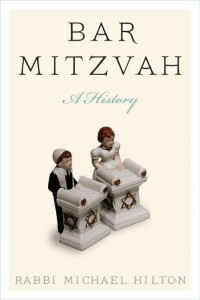 Bar Mitzvah is a comprehensive history of the ceremonies and celebrations for both boys and girls. As cultural anthropology informed by rabbinic knowledge, it explores the origins and development of the most important coming-of-age milestone in Judaism. Rabbi Michael Hilton has sought out every reference to bar mitzvah in the Bible, the Talmud, and numerous other Jewish texts spanning several centuries, extracting a fascinating miscellany of information, stories, and commentary. Michael Hilton is Rabbi Emeritus of Kol Chai Hatch End Reform Jewish Community, a lecturer at Leo Baeck College London and a Honorary Research Fellow of the Centre for Jewish Studies, University of Manchester. He is the author of The Christian Effect on Jewish Life and coauthor of The Gospels and Rabbinic Judaism: A Study Guide.